Idioms and sayings always sound kind of odd when they're translated. My mom immigrated to the US in the 1970s with her parents and brothers, so we all mostly communicate in English these days, which means that when we say our favorite Assyrian proverbs, we usually say them translated. So having grown up hearing so much in translation, now whenever my grandmother says something like "you have only the donkey's tail," it sounds normal and feels completely authentic, even though I'm sure it would probably sound really weird to just about anyone outside of my family (Assyrian or not!). Sometimes when meaning or feeling gets lost in translation, you wind up with something new in its place. But anyway—today I'm thinking of one of my favorites, which goes, "if you break ice, you have cold water," or in other words, "you've been working really hard, and here is the pay off." I don't say this one enough, but it's one of my favorites because I usually need the reminder. It's easy for me to lose sight of accomplishments and just keep plugging away, always pining for the next stage. 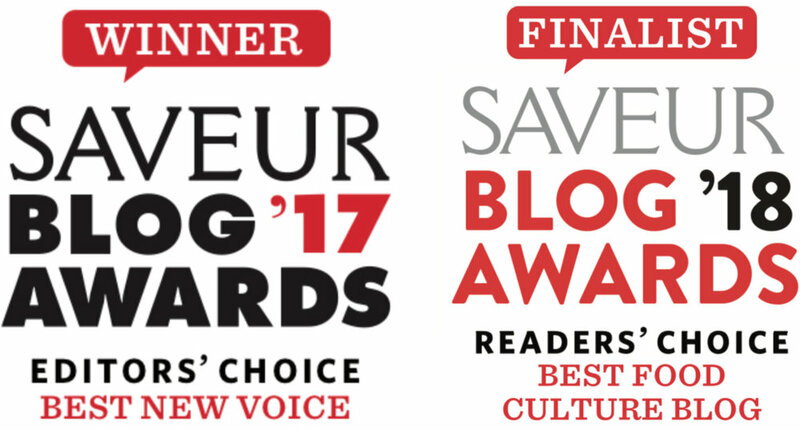 So this weekend, I drank cold water and spent some time reflecting, after finding out that I'm a finalist for the Saveur best culture blog award! It's such an honor to be part of an incredible group of finalists, and I'm very excited to get to know the whole cohort. Being selected for a category that celebrates regional cuisine has led me to spend some time thinking about Assyrian food, and what defines it. When I went to the Saveur awards last year, I remember a lot of people asking me "What sets Assyrian food apart?" which is something I've always had a hard time answering. Part of me thinks that it's a silly question in the first place, because the food my family makes is going to be totally different than the food from another Assyrian family, and many of our dishes are shared by many other Middle Eastern and North African cuisines. It's hard to generalize accurately and respectfully about food and culture, and it's an uncomfortable (perhaps impossible) task to precisely pin down an oral culinary history. But of course, this is a totally legitimate question to ask someone who writes about Assyrian food—it's just that its answer is incredibly complex. But now, after another year, I feel like I can finally articulate some of that complexity, and I'm looking forward to the lifetime it's going to take to see the full picture. So for now, I'll leave you with this list of some my favorite Assyrian dishes, with some (hopefully) satisfying answers to this question that used to annoy me, but now just makes me talk a lot. Feel free to check out family recipes if you'd like even more, or browse my whole recipe collection for a mix of classic and Assyrian-inspired. Booshala is something that is so essential to Assyrian cuisine, it's impossible not to list it first. Yogurt and rice are major staples, and this soup is related to a word that means "cooking" (much like the way "gohan" means both rice and food in Japanese), so it's hard to imagine cooking without it. Everyone makes it differently (with rice or barley, swiss chard or another green, hot or cold, and so on), but just about everyone makes it in some form. While booshala is unique to Assyrian cuisine, there are some other incredible yogurt-based soups and stews throughout the Middle East (for instance shish barak). Gurdthu is another part of the soul of Assyrian food. People eat it a variety of ways, depending on family and region. My family eats it simply with some clarified butter on top, but some sprinkle on coriander seeds, Turkish coffee, or a drizzle of date syrup. When my mom was a kid, she would run upstairs to her grandmother's apartment every day after school for gurdthu with butter. I've found that Palestinians are the only other people who make something similar to gurdthu (although I haven't polled the entire world, so please let me know if you know of another example! In Palestinian Arabic, it's called labaniyeh. Thanks to my friends Mai and Abeer for enlightening me). Assyrians live all over the Middle East (and the world) in a diaspora, and we don't have an independently governed nation. We're indigenous to Iraq and Syria, and many Assyrians continue to live in these regions today. My mom's dad's family is from Baghdad, so masgouf is a big part of our lives, since it's a Baghdadi specialty. My grandparents have many fond memories of trips to the masgouf restaurants on Shara Sadoun, where they would eat fish caught from the Tigris river, and grilled over an open fire. Just like with masgouf, this one is regionally specific, but this time Syrian. My mom's mom's family is from Syria, so my auntie Masy (my grandmother's sister) taught me how to make these. She learned to make them on her family's farm in a village near Hasakah. Kbeibat is a type of kibbeh, which is basically a bulgur dumpling, popular throughout the Middle East. They can be fried, boiled, or stuffed with a variety of fillings, depending on the type. Some kibbeh aren't dumplings at all, like kibbeh nayeh and kibbeh bil saniyeh. A lot of contemporary Middle Eastern cuisine is a product of the last millennium or so, but baklawa is one whose origins can be traced back to the ancient Assyrian empire. The ancient form was very different than the current one (since filo is a relatively new innovation), and it's gone through a lot of changes over the centuries, but my grandmother's baklawa has one thing in common with the original—the syrup she uses is 100% honey. This sweet roux-filled bread is rich with tradition, and as far as I know, it's totally unique to Assyrian cuisine. The loaves are usually prepared in very large batches (although my recipe "only" makes two loaves), often by large groups of people, and they're cut into this beautiful trapezoidal design right before serving. Kadeh is usually served at holidays and special occasions, or simply with chai when you have your favorite guests over. Most Assyrian foods have vegan versions, which we call soma, which means "suitable for fasting." Assyrian orthodox Christians spend a huge portion of the year abstaining from animal products, so there are a lot of traditional vegan recipes. This one is my favorite—vegan stuffed grape leaves, made with lots of herbs, walnuts, mushrooms, rice, and tomato. Dolma is enjoyed all over the Middle East, North Africa, and surrounding areas, and it's another one of those foods that's incredibly diverse. Depending on who's making it and what's being stuffed, one version will taste completely different from another. This is my grandmother's "combination" dolma, which has a lot of grape leaves, cabbage leaves, and zucchini, and is simmered in vegetable juice. It's basically my favorite thing in the entire world. Stew, or shirwah, is an important part of Assyrian cuisine. Shirw'it kirtopie is made with fresh hot peppers, fragrant spices, peas, tomatoes, and (of course!) potatoes. It's one of my all-time favorites, because I absolutely love spicy stews. But if I had to pick one that's closest to my heart, it would be riza shirw'it fasouleyeh, because it's the one I had most often growing up. There's a misconception that all Middle Eastern stews are spicy and fragrant, which is not always the case. Some are simply made with delicious vegetables and spiced simply with black pepper.